Hey everyone, I hope you're just peachy and enjoying summer. I'm on my way out the door for the day for some spa time and then, park time with my little boy, but first I simply must share a new creative project that I've launched on that you can participate in called #cattledogsmonday. I recently decided that I needed to use Instagram to connect more with others and to challenge myself more. I miss those days on Flickr when there were so many fun groups to participate in. Nowadays, it can seem like you're pumping out content and getting nothing in return, but with hashtag projects you can gather people together and have a genuine sense of friendship while also challenging each other to be creative each week and share what's inspiring you visually. Social media needs to be a little give and take to keep you inspired, right? That is why I started a weekly mood board challenge on Instagram called #cattledogsmonday, and it kicks off each Monday because that's the day when most people feel the flattest creatively speaking. Mood boards have been part of my life since childhood. I plastered favorite things all over my door or part of my bedroom wall, or inside of albums composed of stickers, posters, Polaroid's and pretty papers that I collected from Japan. Then there was my school locker - I loved to decorate it with favorite papers and things. When I got my own first apartment, my fridge door was different each week with new images and photos that inspired me. One of my first jobs was working at a modeling agency in Boston and in my office, I created a giant floor to ceiling mood board of favorite top models and fashion labels. Later, I worked on many mood boards alongside interior designers and architects during my corporate years. When I went back to school for design, they were some of my favorite things to make in school and later, for my clients. I've made, shown and detailed how mood boards aid in the creative process in each of the three design books I've authored. I even taught mood board workshops at Anthropologie stores across America and in London in 2011. For the past 6 years, I've been using mood boarding as a teaching technique with my students to help them find their personal style and vision for a project. Mood boards have been a part of my life since childhood. I'm sure many of you can trace back to earlier days when you were also collaging and sharing your favorite things visually on some surface, whether that be a scrapbook, wall, locker door, refrigerator or the back of your door in your college dorm. I personally love seeing my favorite things collaged together for a quick burst of inspiration. It makes me feel more creative. It allows me to visually explain what's in my head when words don't work. They are my non-painter's art work, I guess. A form of self expression that has always come very naturally for many of us. They keep me inspired and on track, help me to plan and execute projects of all types, from books to decorating my home, and I use them as a sort of mind mapping exercise because I'm highly visual. They help me to find my way back to intentions and goals during times when I lose steam or veer off course. Beyond how I've benefited, I've witnessed first hand how mood boards help others. When students make them, their instant reaction is usually, "This was an extremely helpful exercise, I finally feel like I finally found my style!". Mood boards help us to pull together ideas in a more cohesive way in order to make sense of the many ideas floating around in our head. When perusing online seeing a million different visual inspirations, it's easy to forget what you really are connecting to on a personal level. You can easily lose your way and lots of times, not even know what you like anymore because you're so saturated in images. Although that doesn't sound like a terrible problem to have, it can be if you need to decorate a bedroom, plan your wedding or rebrand your website since honing in on what you love is the only way to make good decisions. If you're on Instagram, I invite you to take part in my weekly mood board challenge. All you need to do is upload a photo that you take on Monday (or any day that week) and hashtag it #cattledogsmonday so everyone can see what you've posted. It's a great way to meet new like-minded friends. Try to make a new one each week and photograph it in natural daylight (no flash). Also, please make it by hand, no digital collages or photo grids, etc. 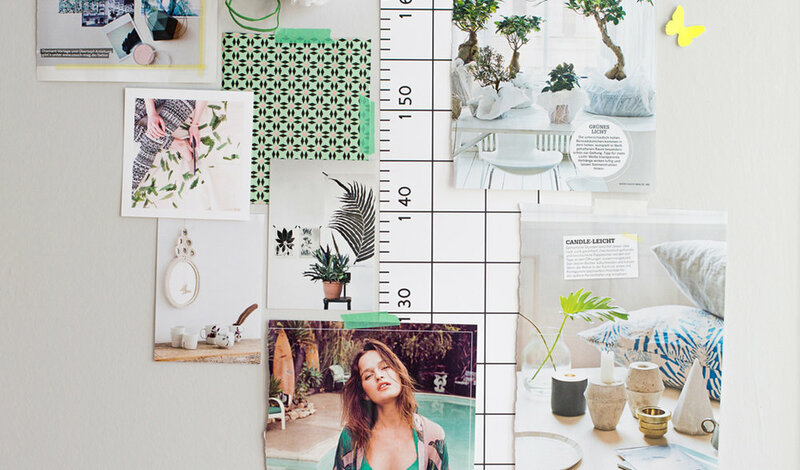 Your mood board should simply show what is inspiring you this week. It can show anything from magazine pages or personal photos, fabric swatches, ribbons, papers, whatever! You can lay everything out on a table and shoot downward or pin or tape to a wall and photograph straight on. You can participate weekly, just once, biweekly, it's up to you! The only rule is that you do not post unrelated photos using our hashtag, so please no spam! I hope to see you over on IG! I'll be posting my weekly mood board on soon, mine from last week is shown above when I was into green, plants and beachy blues. I can't wait to see what is inspiring you this week. #cattledogsmonday - spread the word!